May 12, 2009....The photo you see is to show that Big Mike is trying to collect what is called the microphone que block or mic flag. So far Big Mike got a radio station mic flag block and promised not to mention the station name or show the block. Here are WCBS-2, WPIX WB-11, WNBC-4 and CNBC, News 12, WMGM (NBC) 40 and WABC -7 blocks. Trying to get cable stations, TV stations and radio stations blocks from around the country. Old or extra blocks wanted. If you are a reporter or a newscaster of a TV or radio network. Has a old or extra cue block for Mike to collect. Please e-mail with the subject "(your station) Mic Que Block." Thank You in advance! Mike got a mic flag from WMGM 40 from Atlantic City, NJ. Thanks to the station for the mic que block. 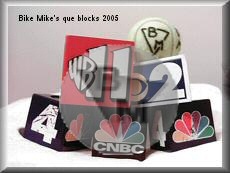 Big Mike has sent a e-mail to WNYW Fox 5 NY about the mic flag block on January 25, 2006. He has not gotten no response since then. Big Mike has not given up on his bicycle when he fall. He will not give up collecting tv, radio and cable tv microphone flag blocks. More updates will come as Mike continues with his mic flag block hunting collection.